When you register for classes at UNA, a student account associated with your student ID number is established and your student account is charged for tuition, fees, etc. Electronic Billing (e-bill) is the official means of providing student account statements to all UNA students. A notification of statement availability will be sent to your UNA Portal e-mail account and to the e-mail address of each of the authorized users the student has identified. 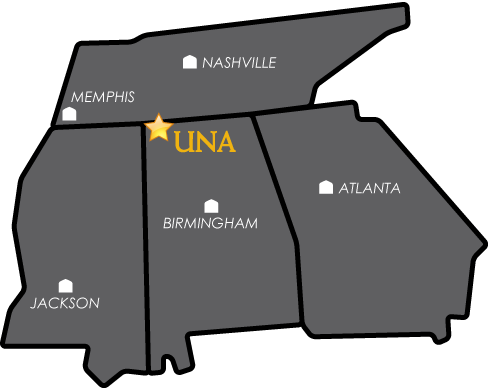 Students and authorized users can access the student account by going to the UNA homepage and selecting UNA PORTAL. Students are expected to meet all financial obligations when due. It is each student's responsibility to be informed of all payment due dates, deadlines and other requirements. Delinquent accounts are subject to a $50.00 late charge. A student's schedule is subject to cancellation for failure to pay delinquent balances in full. Once canceled, a $75.00 reinstatement fee will apply. A financial hold will be placed on the student's academic record when there is any past due financial obligation to the University. When there is a financial hold, the student will not be permitted to re-enroll or receive transcripts or any other service from the University. Collection costs, including all attorney fees necessary for the collection of debt to the University, is paid by the debtor. Any Federal Title IV financial aid recipient who withdraws on or after the official first day of the term will be liable for any funds the University of North Alabama repays to the applicable federal program as a result of the withdrawal. These amounts will be charged back to the student's financial account. University collection procedures will apply to recover these funds. To access your account, go to www.una.edu and log into your UNA Portal. You may also access your student account directly by going to the UNA homepage and selecting Resources and Tuition Payment. Non-student payers who have been authorizes by a UNA student may view and pay a student's bill on their behalf. Authorized payers can only be established by the student. UNA cannot establish an authorized payer for the student. Authorized users will first be prompted to log into a secure site with the appropriate ID and password combination. The authorized user that you have specified will receive an email notification containing their initial password and login instructions. An email notification will be sent to each address provided when a new e-bill becomes available. Log in with your email address and the initial password information provided in your welcome email.